It’s uncertain whether this is a story that fits better in a horror film or a comedy, but the bizarre phenomena of ‘Sleep Texting’ is one that appears to be growing swiftly among the millennial generation. 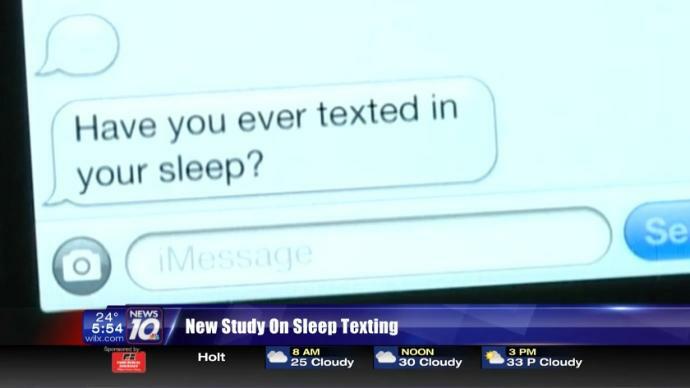 Sleeping with your phone next to your bed can lead to the horrifying discovery in the morning that you sent a text to someone that you don’t remember sending; a study at Villanova University found that over 25% of 372 college students had sleep-texted before, and of those 372, over 72% of them could not remember they had done it. In the past, such a catastrophe would have usually only occurred after having one too many glasses of wine the night before. But times have changed drastically and either when a person is drifting off to sleep, or in sleep state itself, they can find themselves reaching for the phone and sending a message – certainly, remembering what was actually written seems an almost impossible task upon waking in the morning. Thankfully, the majority of those studied reported that their messages tended to be nonsensical and made little sense to the doubtlessly bewildered receiver, who, in the early hours of the morning would hear their phone beep to a message of “Hoof on your tail” or something cryptic like that, which could lead either to several hours spent trying to decipher what could be code-breakingly worthy of MI5 agents, or else regarded as drunken gibber which receives a swift deletion and an outraged grumble due to being woken in such a manner. One small blessing is that the phenomena does tend to apply to students, so there’s much less chance of accidentally messaging your boss or coworker, which could lead to seriously awkward moments at work the next day, worse even than the humiliations of Christmas functions. All jokes aside, sleep texting is indicative of a generation whose reliance on their phone is becoming increasingly demanding – creepy, almost. Technology’s power over us grows day by day and as sleep texting shows, even to the point of controlling us while our subconscious mind takes over. This is a cause for concern and one that our society will undoubtedly begin to take seriously. Insomnia and sleep deprivation are also common consequences of phone addiction; with an increasingly busy schedule and reliance on phones that wasn’t present some twenty years ago, millennials find themselves with maybe six hours or less sleep per night, certainly less than the recommended amount which is eight hours minimum and which leads to an increase in both mental and physical health problems. We see it every day; youths attached to their phones on buses, trains, on the streets, while out with friends – even inside the home, people have a tendency to communicate with each other via their phones, tablets or laptops, despite simply being on separate floors! It is a slow, creeping menace that is settling on our society, a dark cloud that we only noticed once it had grown in size and strength. This latest study will no doubt raise some concerns and questions of the impact of unregulated technology on our society, for what could be next? Could the war between Man and Robots be forthcoming even sooner than many sci-fi fans anticipate? Previous articleHidden Gems of London Series: Brentford – The Battlefield of London. Thanks. We will look into resolving the issue.